Yesterday was another planting day. I got 40 onion sets planted. I have gone with Radar and Electric (a red onion) and have planted them in 2 blocks of 20 each. However I have 30 of each left and have been advised by members of the UKVegGardeners Forum that they cannot be kept and planted in spring. As I don’t want to plant any more of these, some of them are up for grabs if anyone would like them. I’ll offer some to my neighbour too. Also to go in were peas. 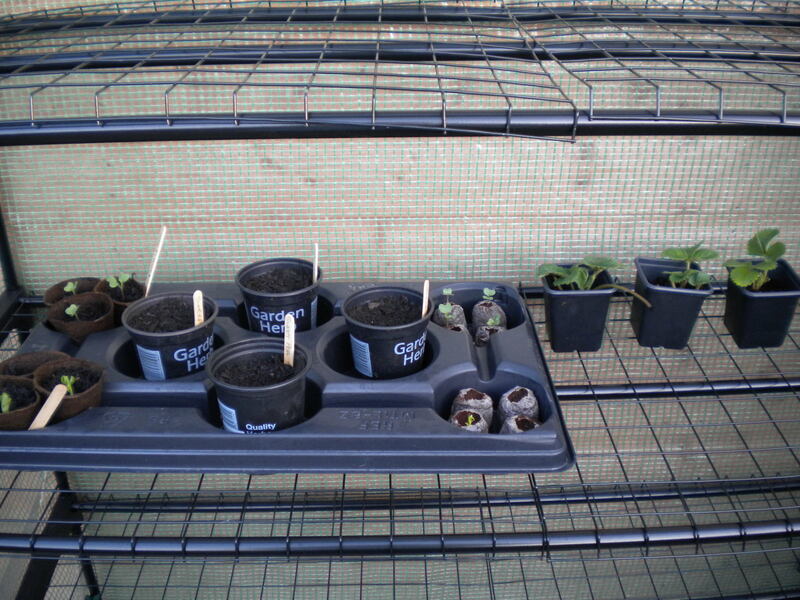 I have the 7 that I put into the pots and Jiffys but as they are starting to grow now I thought I would just get on and put some straight into the ground. 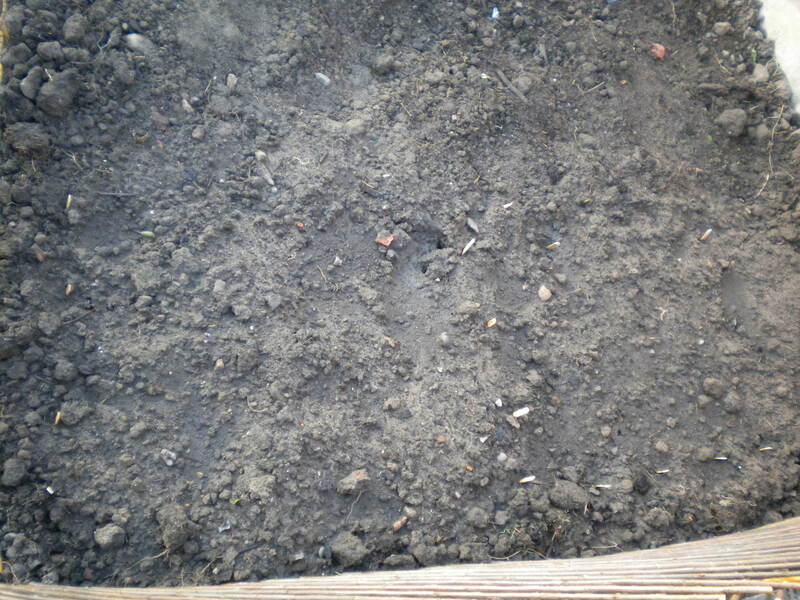 I dug over a patch and then made 4cm deep holes with a pencil and dropped one pea into each hole. I have no idea of the spacing but I put in a total of 46 seeds in a large block. They are Pea Meteor. 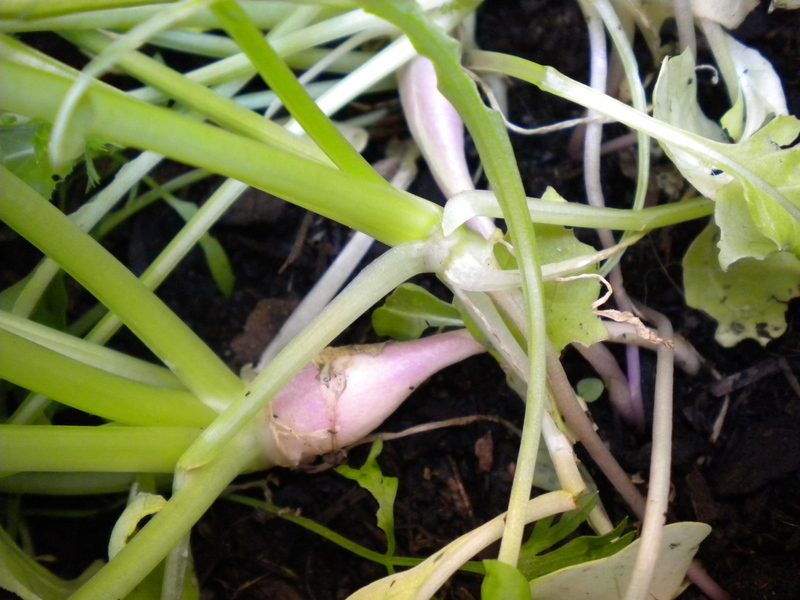 The turnips I sowed in the patio grow bag are doing well, however the roots were starting to swell above the surface. Once more I took advice from UKVegGardeners and Flighty said they should be covered. So a combination of thinning out, pushing down and earthing up now has them covered and on their way. There are only about 5 or 6 in there but I don’t think I have ever eaten a turnip so I’m not sure if I will like them. It is all experimenting at this stage! 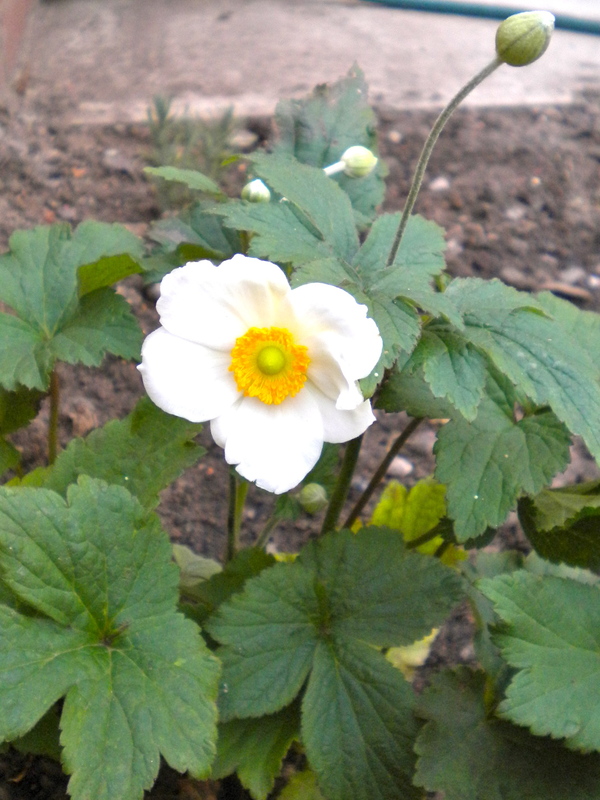 And look…….the anemone must have been listening yesterday and has opened one of its flowers……. I got quite a few things done yesterday. I’m afraid Morrisons’ plant section managed to ensnare me once again but I only spent a fiver and got 2 perennials and 2 different types of bulbs. The bulbs were £1 a packet for 6 snowdrops or 10 fritillaries. There were various others there too but I just chose these. The perennials I got were 2 for £3, a Heuchera Ruby Bells and a Penstemon Picotee Red. They also had good size Cordylines but I left those for now. So the bulbs are now in the lavender bed. 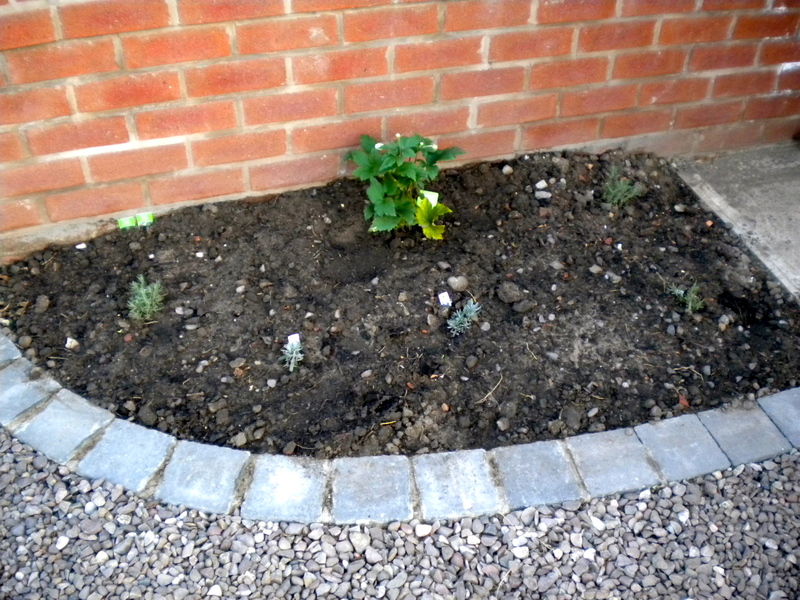 It doesn’t look much yet, the lavenders are very small and the bulbs are obviously underground but you can see the Japanese anemone! 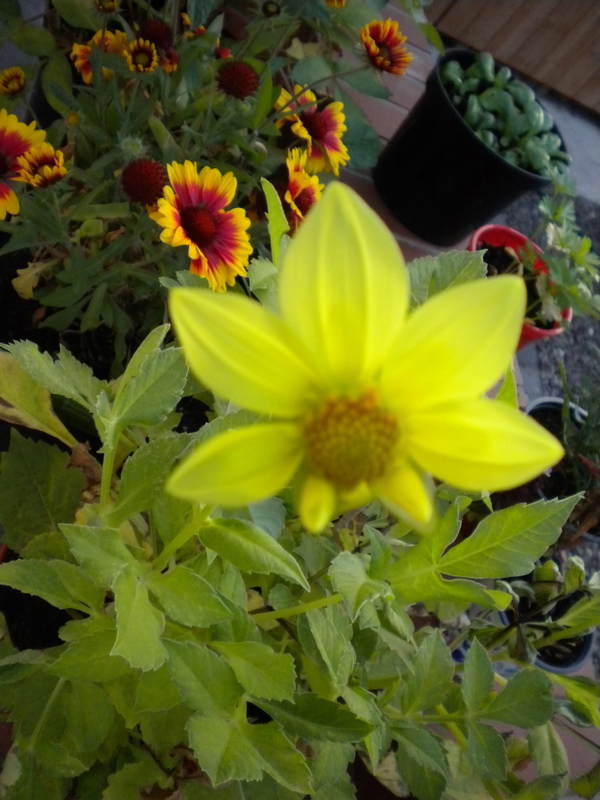 I’m hoping the 3 buds on it will open before it gets too cold. I then checked on my cabbage and pea seeds in the growhouse. All 7 cabbages have germinated and 3 of 7 peas so far. There doesn’t appear to be any difference between the Jiffy 7s and the multipurpose compost in terms of germination. I have put my three strawberry runners in there and the four large pots in the middle contain 3 sweet pea seeds each, also sown yesterday. I’ve planted 2 pots with Spencer Waved Mixed and 2 with Butterfly Kisses. And then I did some real planting!! I put in my garlic! I planted one block of Vallelado from the Organic Catalogue. I had 3 bulbs which gave me 20 decent sized cloves. And I had 1 bulb of Solent Wight from SimplySeeds from which I got a block of 16 cloves but some of them were quite small and may not be viable. Here’s a picture but it is just of a bed of soil and a few lolly sticks!! I’m not sure if I have planted them too deep but I guess all will be revealed in due course! The skies were darkening for a rainstorm at this point so my intentions of planting the onion sets were scuppered but that is a job for today. 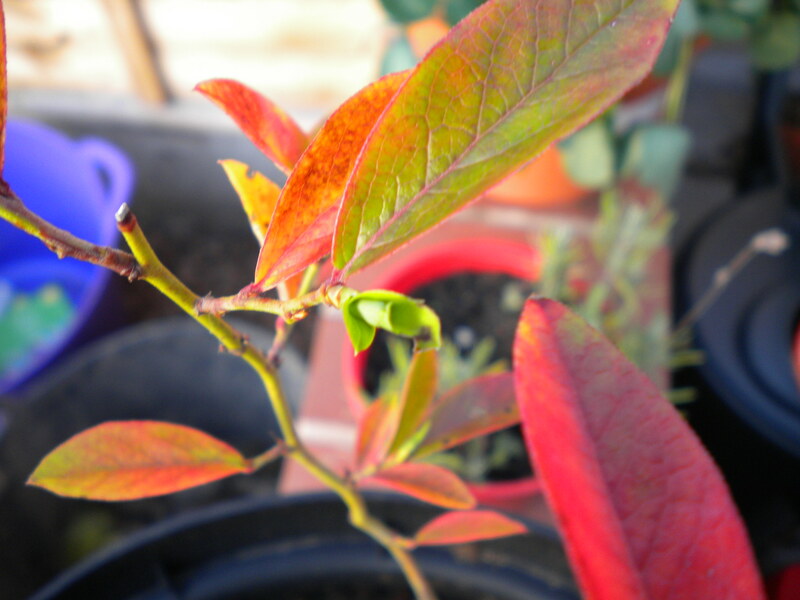 In other news…..it seems my rescue efforts on the blueberry worked, it has produced the first new growth since I’ve had it!! I’m starting to feel like a proper gardener now! !